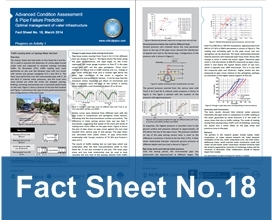 The Sydney Water test bed (refer to Fact Sheet No.5 and No.15) is used to examine the behaviour of critical pipes buried under road and subjected to external loadings including traffic. On November 2013, traffic loading tests were performed on site over the bitumen road with two trucks with various axle groups (weighted 22.5 t and 38.6 t). The tests were performed over the instrumented pipe with 0, 30 and 66.8 m internal water pressures, and the truck tests were carried out while the trucks are stopped, passing,braking, cornering, and passing over a simulated speed hump on the road.